I’ve somehow managed to misplace the photos I took of the moon cards… When I find them again, I’ll add it in. In the meantime, you can find most of them on google images if you’re interested. Both of these cards depict two creatures looking up at the moon, standing between two pillars with water in the foreground and a crayfish. The moon is looking down on the scene and in the distance are hills. This moon is glowing brightly but remember that the moon doesn’t shine her own light, she reflects that of the sun, which is currently hidden. Even in the dark, the sun is still there. Like the moon reflects the sun, the subconscious reflects the world around us – inner experiences reach the outer mind through imagination, dreams and creative practices. The moon casts shadows and distorts what we see, there is a strangeness to the world when the moon is out, nothing is quite what it seems. Magic and mystery slides in the space between dark and light. On the rws card, the two moon gazers are a dog and a wolf, representing the tamed and wild sides of ourselves. In the pagan cats, we have a cat and a dog instead, perhaps also representing the tamed and untamed but in a more subtle way – it has long been said that humans tamed dogs and cats tamed humans. According to Pollack, the crawfish (I thought it was a lobster but I defer to her wisdom) at the bottom of the image is emerging from the water but will never completely come onto land, instead falling back again. This feels a bit like the ebb and flow of the tide, a phenomenon which is itself a lunar process. It also echoes the just out of reach-ness, just beyond seeing-ness that can permeate the moonlit night. Interestingly, the cat in the pagan cats appears to be lifting the crawfish out of the water suggesting an attempt or desire to pull that elusive thing out of the unconscious and into the conscious realm. If you’ve ever tried to remember a dream, you’ll know how futile this is! In tarot, we see two pillars as a gateway, such as that in the high priestess card. Here we are standing on one side, on the side of the known, with the unknown or unknowable on the other side. Where the RWS and pagan cats depict animals between pillars, the wild unknown is animal free but does feature two tall trees reaching skywards towards the crescent moon. The sky is dark, the trees white and the moon golden and I find the simplicity of this card interesting for such a complicated meaning. The image is a silhouette and this reiterates some of the ideas of not seeing clearly, not seeing all that is in front of you and things being distorted in some way. The two trees are illuminated by the moon, they are depicted in white, and it suggests to me that we are being welcomed through the gate I mentioned in relation to the RWS card. This gateway is encouraging you in, inviting you to explore your subconscious and dream world. Make friends with the darkness, with what scares you, with your inner self. Things aren’t always as they seem; deception, confusion and distortion rule here. Fears are ever present, but in the shadows, you can find gold. Through shadow work you can explore the darker parts of yourself consciously. The moon can illuminate your subconscious self and if you embrace and work with it, you can harness your innate power and work towards an illuminated self. Going through the moon realm, you can bring light to your unconscious self and grow. It has a different power to the sun. The sun directly feeds and nourishes our bodies, the moon gently encourages and invites us to feed and nourish our souls, ourselves. The moon is no helicopter mom, the moon is the mother that gives you the resources, skills and knowledge and steps aside for you to discover things for yourself. The moon encourages us to dive deep, to dream deep and to transform. We see the world though our own unique lenses, through our experiences and emotions and this changes what we see. We see what we expect to see, we see ourselves reflected in what surrounds us. What each person sees will be different, will be slightly distorted by where we see it from and which pool we see it reflected in. Further, each night we see the same thing differently. Each night has a different amount of light which transforms what we thought was static, the trees, the water, these things change with the cycle of the moon. As the owl swoops across the moon, she seems to grow. Things in the dark can seem larger than they are. What is it that you are escalating? What do you think is bigger that it is? Are you making mountains out of molehills? On the flip side, what are you refusing to pay attention to? What are you ignoring? What is having to make itself bigger for you to notice? The Brady Tarot moon is very similar to the animal totem tarot – two trees frame the image, an owl is in flight in front of a full moon and a body of water is underneath. This card however also features the crawfish. In addition, there are two coyotes in the background, one looking out of the card and the other howling to the moon. Looking more closely and into the darkness we also find two opossoms in the trees. This card, more so than the others I’ve looked at, illustrates the night as a realm of it’s own. It has its own inhabitants and it’s own way of being and it’s own way of seeing. To understand the moon realm, we must immerse ourselves in this world, become one of the characters and feel our way into the part, intuitively. It would be impossible to talk about the moon without also looking to some of the common lunar associations. The moon is also about the feminine, about fertility, creation, mystery and power. It is about the daily tides, the monthly menstruation cycles, the seasons and all of nature’s rhythms. The moon asks us to embrace the circularity of life, the ebbs and flows, the ups and downs and to trust in the darkness and have faith that light will return. Mary Shelley is centered in the card, a full moon in front of her and what look like two horns behind her, perhaps an echo of the antennae of the crawfish? Of course, Shelley is famous for Frankenstein, an amazing tale of the things that can happen in the night, in the imagination and what can occur when man made monsters are released onto the world. With this we have themes of death and rebirth, of resurrection and transformations. We lean into what can happen in the shadows, in strange dreams and fantasy worlds. I feel like Shelley is asking us to pay attention to our dreams, both night journeying as well as hopes and goals. She is asking us to express those ideas we find in the moon light, whether that is in writing like her or in art or science or whatever it is that makes you feel most alive. How can you draw inspiration from the world around you? What transformations are currently taking place in your life? What visions are you bringing to life? Whether it’s depicted as the Wheel, the Wheel of Fortune, the Wheel of Time or the Fates, this card brings with it change and cycles and uncertainty. Each Major Arcana card is associated with a suit, in this case the wheel of fortune is a fire card and knowing this can help us lean into the meaning. Without knowing anything else, we get a fast, sparking, energetic vibe, this is not a card about staying still. The Rider Waite Smith image involves a lot of symbolism. There are many layers to this card and we’ll get a sense of that as we start to unpick things. You can take the image at face value without knowing what the symbols mean, less so for the RWS but this is easy with some of the other decks. With the RWS symbolism, from the little I know and have read, we have alchemical symbols which correspond to the suits of the tarot, zodiac signs depicted in the four corners and so on. In terms of the zodiac, there is a Scorpio eagle, Leo the lion, Taurus and apparently Aquarius – all of which are fixed signs if you know anything about astrology you might want to ponder this. The wheel itself seems to be resting on the back of what might be a devil and the wheel has a sphinx? On top and a snake to the left. According to Michelle Tea, the snake is Typhon, a murderous monster in a downward spiral – he has had his time on top but no longer. What I think looks like a devil is apparently Anubis (half jackal and half human) who is protector of the dead, who guides souls and brings new life. The sphinx is indeed a sphinx who is enjoying her time up top. There are a lot of different ways we can relate to this card through the different depictions and we will all, at one point or another, be each of them. Rachel Pollack instead says the snake is set, Egyptian god of evil and bringer of death into the universe. In some stories, Anubis is set’s son and so the decline of set gives space for Anubis to step into life, the cycle of death and rebirth is played out – “psychologically, only the death of the outer self can release the life energy within” (pollack). The sphinx represents Horus, god of resurrection and so symbolises the triumph of life over death. Pollack also notes that the wheel originally symbolised both the mystery of nature and the human ability to take part in that mystery through a ritual sacrifice. This may sound sinister to our 21st century ears but sacrifice could just be about letting go of that thing which is no longer relevant, that belief which is no longer appropriate or that idea you have of how things should be. She goes on to point out that the important thing about change is the reaction you have to it. Do you embrace change? Do you struggle against it? Do you drain all your energy trying to fight it? I find this interesting given the cat is clearly on the outside of the wheel, here she will feel a greater impact of change, and perhaps experience greater change because of that resistance to throwing herself at the centre. Instead of just select astrological signs, the pagan cats wheel includes all the zodiac symbols and the planets. Having observed this, I’m now mulling over what I think it might signify but am not feeling anything obvious – I’d love to hear from you if you have thoughts! This particular wheel of fortune card is one that I’ve leant into in a deeper and deeper way the more I’ve learnt about tarot. The card shows a complicated web of rainbow treads, weaving in and out and getting tangled in branches and ultimately creating a circular wheel akin to a dreamcatcher. The top half is in darkness with a crescent moon and an owl and the bottom half is light. Things are a bit topsy turvy right now. As with the previous cards, change is a key element here. We are asked to be the change or to feel into how change is showing up for us. How are we responding to those changes – are we clinging on for our lives desperately trying to be in control of the change or are we going with the flow? The tangledness of the image reminds us of how intertwined life is. It is a visual representation of the interconnectedness of all of us and how everything is connected and united with everything else. However random events in your life may feel, they are connected somehow, just in a way that us mere mortals can’t see. Life is messy and it may not feel like things are going as they should but have faith that the universe is keeping you on your path, even if it doesn’t feel like it. Related to the idea of life as messy, we can use the card as a reminder that life, like a tangled ball of wool, only becomes untangled with time and patience and making a bit more mess first. Where the phases of the moon were hinted at in the wild unknown, they are explicit with the lumina tarot. A feminine figure stands at the centre of 8 arms, each reaching for a different moon phase. Above sits the moon and she stands on the sun, echoing the wild unknown. Etched into the moon is the symbol for Jupiter which I’ll look at a bit later on. The centring of the figure suggests she is at the centre of the wheel of fortune; she is moving with the flow not resisting change. Fighting it makes no difference to what happens, just how you react to it. The moons in this card speak to me of cycles – the lunar cycle, the way tides flow in and out, the way a year moves through seasons and the cycle of life that we all experience. Everything changes and everything passes. We also cannot skip a stage of the cycle. You cannot go from new to full moon without passing through the crescent moon on the way. Works of Literata expands on these ideas around cycles and phases in a post about the wheel of fortune. In the Simplified Tarot, the wheel of fortune shows a wild looking woman turning a crank to spin a wheel with 6 of the zodiac signs on it – Pollack suggests that this is saying in a direct way we make out own luck. The Chrysalis Tarot has a somewhat different image to most of the other decks I’ve looked at. In this deck, the wheel of fortune appears as though it could be burning. I wonder if this is saying we can take control of our fate? The Herbal Tarot illustrates this card with slippery elm, something which doesn’t take much leaning into to feel appropriate for the wheel of fortune. Finally, in the goddess tarot, the wheel of fortune is represented by hindu goddess Lakshmi who is associated with fortune and prosperity, the generosity of the universe. I find these different versions of the wheel of fortune reflective of the different types of change we all experience, the different ways we move through change and the different levels of control we have over changes. What is changing? How am I responding? How can I stay centred? Have you checked out of your life in some way? Are you struggling to trust that the future will unfold as it’s meant to? Who is spinning the wheel? Where on the wheel am I? The fixed signs are not as interested in manipulating their environment as their Cardinal brothers and sisters- they are happy to concentrate on personal matters and will resist outside attempts at trying to change their lives. They tend to hang on to the past, which is their biggest weakness, but they are strong in their stability. In the context of the wheel of fortune, these signs feel like they should be more resistant to change and to the turning wheel so I’m finding it a little strange that they are highlighted. I’d be interested to hear other people’s ideas about why the fixed signs in particular are used on this card. Previously I’ve not really explored the symbolism of the associated crystals but I love amethyst and as a pisces, it’s my birth stone and it’s been with me for over 2/3 my life in different ways so I felt compelled to find out more about it. Firstly, it’s quartz so let’s start there. Quartz comes in many varieties and formations and is the most abundant mineral on the earth’s surface. There is, when you put it like that, nothing special about quartz. But it is special. I have a lump that I picked up as a child and whilst I don’t know where it is, I can picture it as clearly as I can my teddy bears. It was raw and full of character and as I write this, I’m upset that I can’t think where it is. I know I didn’t get rid of it but I’ve moved house so many times… Anyway, back to quartz. It’s clearish and if you look back in time, it was used to heal sickness and wounds and is generally thought of as a basic go to crystal if you are into crystal healing. If you don’t know where to turn, grab some quartz. So, amethyst is a type of quartz. It’s purple colour is down to manganese and iron in the crystal, so really, not only is this quartz, a really common crystal, it’s also impure. And yet, it is so beautiful! I feel this really chimes with the message of the wheel of fortune – things don’t need to be neat and tidy to be valuable, messy and impure have their own rewards. If you start to look at how amethyst is used, you’ll find it’s a magnifier, it enhances the qualities of other crystals and like quartz is a bit of an all rounder. More specifically, it’s allegedly good for protection, balance and interestingly purification… It is supposed to calm eg nerves and environment, and echoing its use as enhancing other crystals, it’s supposed to enhance self esteem, spirituality and meditation. When we are in the middle of change, we often experience it more intensely that it is. Spinning around, feeling out of control, amplifies all the other areas in life where we feel untethered. In the lumina tarot, we saw the symbol for Jupiter. This was echoed in another deck which featured Fortuna on the wheel of fortune (Jupiter is said to be her father). We also find oak associated with this card and again, that brings us back to Jupiter and his counterpart Zeus. Aside: Zeus is linked with oak and when I was looking at plant associations for the wheel, oak was one of them. If this feels intriguing or relevant you might want to explore this further. As a planet in astrology, Jupiter is about expansion and growth and is excited about new things which could be seen as a very healthy attitude towards the wheel of fortune and change. Traditionally Jupiter has been seen as the planet of luck and good fortune so perhaps we should or could see future change as a positive opportunity instead of a negative, external imposition. 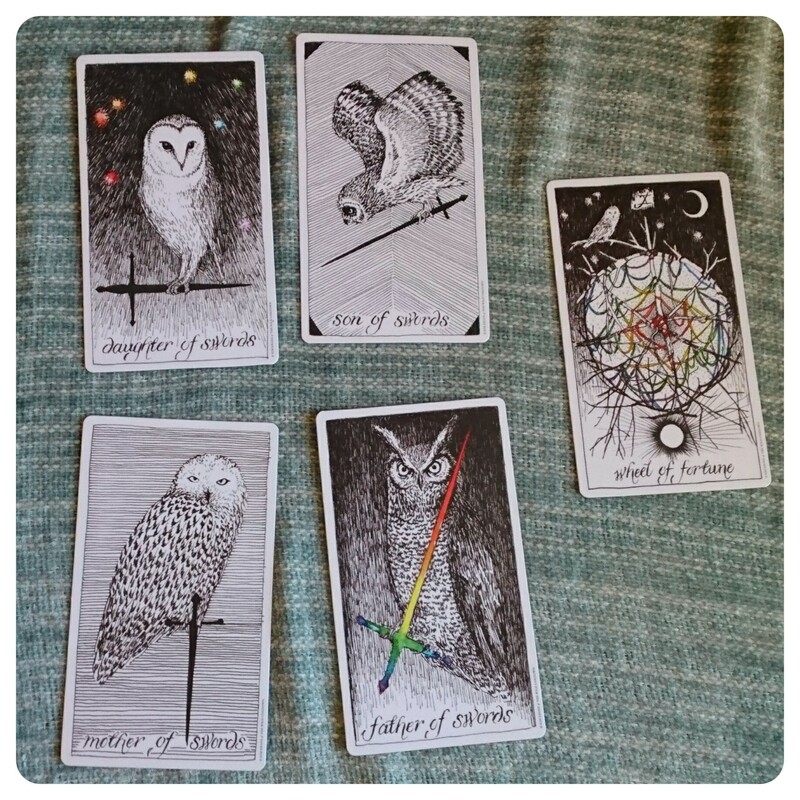 The owl on the wild unknown card is showing herself to be wise enough to step back and observe and adapt, she is not trying to hold onto the wheel or hold back the changes. She looks from the darkness, the unconscious and flows with the cycles instead of struggling against them. She teaches us to adapt and to make the most out of what is coming as it will come regardless of whether you like it or not. The owl, with her wide eyes and night vision, has the ability to see clearly, to see through deception and to get to the truth. Perhaps it is because of this, plus the element of surprise they have due to their silent flight, that some cultures find them such frightful birds. Watch out for people trying to deceive you, or self deception. In some parts of Australia, we see the owl representing the souls of women (and the bat represents the souls of men) which echoes the feminine ideas discussed in relation to the wild unknown owl. One myth recounts the great flood when people were all drowned. It began with a group of children teasing Dumbi the owl, a bird sacred to the Wandjina (spirit beings) . They were horrible and cruel but eventually Dumbi escaped and flew to the Wandjina to complain about how we was treated. The Wandjina became angry and reacted by sending thunder, lightning and rain. Lots of rain. It rained and rained and the water rose and rose and everyone drowned. Except for two children, a girl and a boy who were saved by a kangaroo. These children would eventually begin the repopulation of earth. Now, wasn’t he a wise old bird? Owls have amazing, almost supernatural senses and I don’t think there’s a better place to start than there. Their charismatic faces act like a satellite dish which channel sound towards their ears. Their excellent sense of hearing means they can hear prey which is under the snow. Some owls have ears at different heights which helps them establish the height of a sound not just direction. They can turn their head through 270 degrees which allows them to see and hear a wide range. Their eyes are huge, taking up to 70% of the skull space (for comparison, human eyes take up 5%) which allows them to gather a lot of light and therefore they can see much brighter than we can. Their eyes can flick between seeing an overview and minute detail incredibly quickly. They see the bigger picture as well as the nitty gritty. Some owls have ear tufts but despite appearances, these aren’t for hearing, they’re used for non verbal communication. Owls have a well developed verbal vocabulary and good memories. They have very sharp talons which help them hold onto their kill. If you have drawn this card, think about what you’re not letting go of. Their silent, stealthy flight is due to their feathers which have what are effective silencers on. However this comes at a price, this adaptation has resulted in non waterproof feathers so they don’t fare too well in the rain… Their feathers and wings are constructed so that the owl is a master of slow flight. Essential when you’re looking out for hidden prey. Slow down, look more closely, only go in for the kill once you’ve used your senses to get all the information. What sacrifices are you making in order to develop? In terms of family life, most owls are monogamous and are good parents, but they aren’t great at nest building and tend to steal nests or use holes in trees etc. The owl is a creature of mystery. They inhabit a different world to us, navigating the dark realm with ease which brings us onto myths and legends. The owl and night are inextricably linked and this is reflected in the stories and beliefs that surround them. A Cherokee myth tells how all the animals were challenged to not eat and not sleep for seven days. Most animals did not manage this but the few which did were gifted with the power to see in the dark. The owl was one such animal. Thus, the owl became a creature of the night and therefore of dreams and the subconscious. The owl glides confidently and silently through this realm and her sight lets her see through lies and deceptions, cutting through them like a sword. Their sight also links them with clairvoyance. 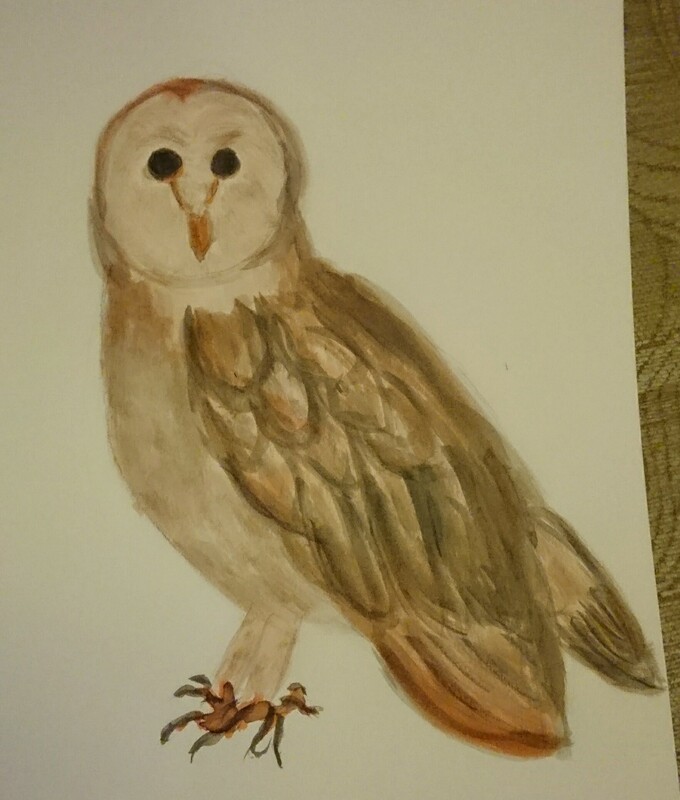 The owl is said to be a messenger from the other world which makes sense when you consider that a lot of birds are messengers because of their ability to fly up to the gods and the night is tied with the unknown and the spirit world. This mistress of the night is linked with Athena, goddess of wisdom, craft and war, and Diana, the goddess of the moon, hunting and nature. In Sri Lanka, a type of owl is referred to as the devil bird and people are afraid of their call because it means something terrible is going to happen. This comes from a myth where a jealous husband killed his child and fed it to his wife. Once the wife found out she ran into the forest and tried to kill herself before the gods turned her into a shrieking and understandably angry owl. The owl as an ill omen is seen in other cultures around the world. I read somewhere that the owl call is one which we can make easily and because of this would be made by humans as a warning that danger was coming. In contrast to this, the owl in the card is the white owl, companion to goddess Lakshmi who is associated with good fortune and prosperity. The court cards of the swords or air suit are depicted by owls, which feels very fitting given their reputation for intelligence and being able to cut through lies and deception. The daughter of swords is watchful, observant and clear sighted. The son of swords is pictured going in for the kill, he is charging ahead, he is in pursuit and he is decisive. The mother of swords is queen of the mental world. She embodies intelligence and logic and is a more mature version of the son. She is still pursuing knowledge and she is determined but she is more considered and thinks things through first. The father of swords asks us how we use our power of thought and communication. He is rational and logical and uses his skills to maintain order. We also see the owl in the Wheel of Fortune. Here she is observing the web of life, overseeing it perhaps but definitely not phased by it’s tangled appearance.